Architecture is a profession that involves a large variation of skills and knowledge, like the processes and the products of planning, designing and constructing buildings and other physical structures. In the past, architects were once labeled as ‘master builder’ as there was no tasks specialization like what this era is having now. Now, the architect’s job scope has been more specialized which usually covers preliminary planning, schematic design, design development, contract documentation, contract implementation, and management. Overall it is about design and management. There is a total of 2023 registered architects (with practicing license) and 2313 graduate architects (those who finished the five to six years course with accreditation of LAM Part II) as of September 2017 in the record of the Board of Architects Malaysia. The aim of the board is to have 10,000 practicing architects in the market by 2020 however this is far from becoming a reality. 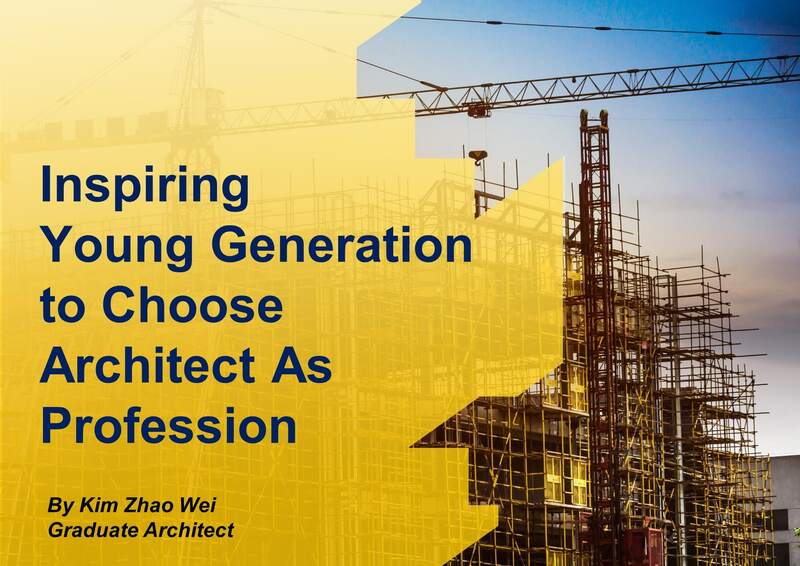 Thus, it is utmost important for the practicing architects, especially those registered architects and graduate architects to engage with the young generation to tap in more new blood’s talent. In architecture, there is the macro thinker and the micro thinker. Most of the time, architects are labeled as a macro thinker with the saying of a jack of all trades, master of none. Meaning to say, architects can see things through different dimensions and identify the connection in between. For example, to make a good and persuasive design proposal, there is a need to understand not only the client’s need and the technical details, it is also about how well the architect understand the surrounding, history, culture and the people (end users). Some architects may develop the interest being a micro thinker who focuses only on technical issues. They are detailed oriented and are good in regulations. There is no right and wrong being either of them, but to know which thinker one belongs is important. With that self-understanding, it is easier to position oneself in the industry and optimize the potential. In architecture, the system for design and management can be learnt. It is to increase the efficiency to handle the sheer volume of information, documents, and resources. A good system can capture all the information like client’s brief, engineers’ design and input, calculations, landscape designs, planners’ designs, documentation and shared among the involved parties. Transparency, instantaneous information sharing, and systematic information structure are the keys to making a great system. Ensuring the right person can get an instant message with clarity is one of the factors that could improve the productivity of the people. In architecture school, one will experience the process and the system on how to handle such process is taught. In this 21st century where saturation of information is a norm, having a system to sort and manage is important to stay competitive. Hence, it is the advantage to have a personal system to handle the daily life chores and expand it towards handling the whole company. In architecture, there is an opportunity to learn about the methods to create. For a person who is practical, architecture is very suitable as it is more about practicing than studying. Designing a building, for instance, a house is not as simple as it seems and involves different technical knowledge. From the design of every space, each opening, structure materials, finishing materials, building structure, natural day-lighting, ventilation, water discharge and supply, waste management and comfortability are part of the design consideration for a single house. Each of the niche knowledge can be consulted from every different professional. Finally, with all the information gathered, then only a great design can be created. Thus, by studying architecture, one learns about the process of creating a product. It is very beneficial as this is an era where intellectual properties do generate a lot of profits. Besides, in architecture, everyone learns about cooperation and communication. Communication is the key to great cooperation; great cooperation ensures fewer disputes and variations during the projects. In other words, this increases the productivity and efficiency. Being in the school of architecture, everyone is trained to be a presenter. Every single project will end up with a presentation to the panels, justifying the design decisions and concept. It not only improves one’s public speaking skills but also increase the self-confidence. Besides that, there are opportunities to work with others on projects. In a nutshell, with the communication skills to make collaboration happens, one can manage a team and even a company. It is helpful as this is an era where no man is an island and collaboration can create miracles, even in a small startup! Ultimately, being in such rapidly changing society is never easy for any youngsters. Henceforth, it is wise to pick up the skills mentioned above that could be provided by architectural study so that one could develop resilience and competitiveness to survive.